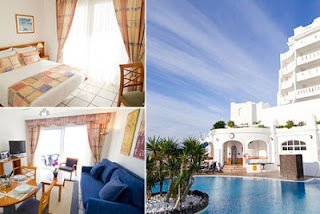 Groupon Ireland has a good deal for early summer holidays in Tenerife at a 3-star resort with an excellent 8.8 out of 10 rating on booking.com. 4 persons in a self-catering one bedroom apartment will pay a total of 180€ (that's less than 7€ per person per night). The deal is valid at the Santa Barbara Golf and Ocean Club***.